NEW YORK – This is the end of my three days on Hyper Island. We learned a lot about Digital strategies, tools and measurement, all of which were important, but none of them are the most important thing. The organizers and instructors here were superior Digital practitioners, but their real strength was being superior Change Agents. Change was the explicit topic at the beginning and the end of the three days, and a constant theme throughout. “Digital” isn’t just a change for our industry, it’s a harbinger of change. The changes and challenges will keep coming and always cause discomfort. Rather than trying to feel comfortable, the smart strategy is to embrace discomfort. Stick to the mission, which is keeping up with the changes. Hernán Cortés understood how wanting to stick with comfortable ways could distract people from a journey into unfamiliar territory. He led a group of Spanish ships to conquer the Aztec Empire. 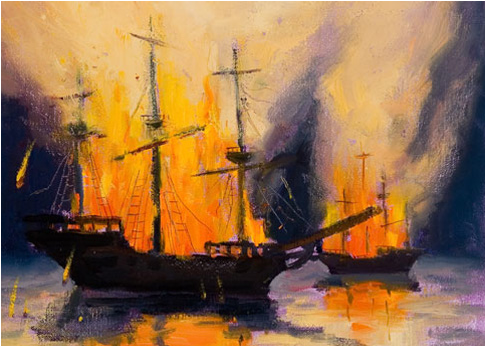 When they arrived at Veracruz, he burned the ships so his men would have no way of going back. That’s the spirit we decided to carry back to the office on Monday. Yes, we will go back, but having metaphorically burned the ships, we won’t go back to the ways with which we’ve grown comfortable. It was a great week. Thanks very much to the organizers, instructors, and of course my fellow shipmates.